The country’s finest young up-and-coming stars were honoured at the Emerald Crystal Juvenile All Star Awards in Tullamore Court Hotel (February 27). “It’s been a terrific year for our association and in particular for our juvenile athlete’s” said Athletics Ireland President Ciarán O’Catháin. “It makes me proud to see a number of our athletes travel to major track events and be successful at the European Youth Olympic Festival in Tblisi, the World Youth Championships in Cali, Columbia and the European junior championships in Sweden” explained O’Catháin. 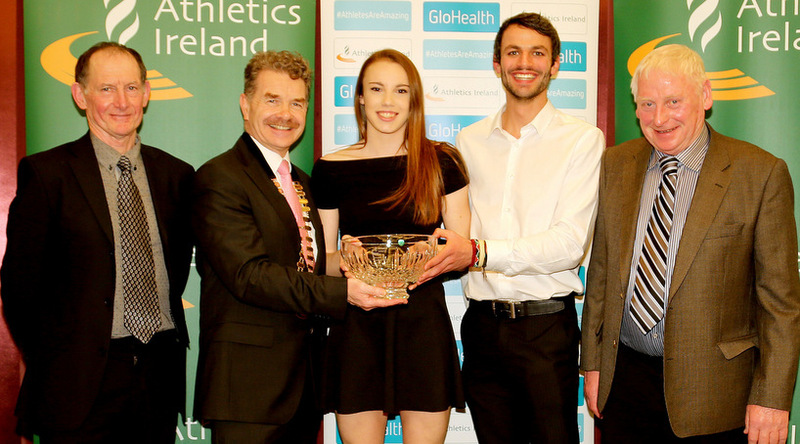 Guest speaker on the night, World University Games gold medallist and Irish record holder for 400 metres hurdles, Thomas Barr, encouraged the award winners to stick with athletics after their juvenile career transitions into senior athletics. “My athletics was going well, but it was a big social thing to me and my friends were moving away from it,” explained Barr of when he completed his leaving cert and moved to college. “I could have easily stepped away and if I had, I wouldn’t be sitting here with you now,” continued the Ferrybank star. “I wouldn’t have had an Irish flag draped around my shoulders at the World University Games last summer and would have not been able to enjoy athletics on the world stage. On the night, Cushinstown A.C multi-event star, Elizabeth Morland, was awarded the Robin Sykes Award for outstanding performance in 2015. In 2015 Morland set an Irish Youth Heptathlon record of 5612 points and equalled Sarah Lavin’s 100 metre hurdles national Youth record of 13.62 seconds.